Fell Hall was renovated from a men’s residence hall in 1989 and is now devoted to academic and administrative space. 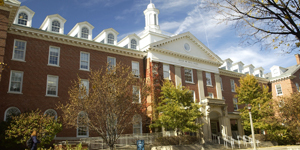 Fell Hall is home to the School of Communication, University College, International Studies, Student Access and Accommodation Services, and student-run FM station WZND and TV-10 news. One of the campus’s oldest and most unique buildings, Fell Hall was named after Jesse W. Fell, the University’s principal founding father. Fell led the campaign in 1857 that secured the financial backing in order to guarantee that the University would be located in Bloomington. Fell was born in 1808 in Pennsylvania and journeyed to Illinois working along the way as a teacher and journalist before earning a lawyer’s certification. Fell Hall was the first campus residence for women and was completed in 1918. The south wing was added in 1949. The University closed the building in 1989 in order to begin a $12 million renovation; it was reopened again in 1992.